There is a saying that says 'Everything must change so that everything stays the same.' This is particularly apt when modifying your home to meet the needs of someone with a disability. Adapting to a disability can be very difficult, whether it is your own disability or someone close to you. In order to make things easier, there are some disabled home essentials that you need to be aware of to help life go on as normally as possible. If you need to modify your home for a disability, then here are some of the ways you can go about it. Financial aid is one of the ways that you can get help to modify your home. 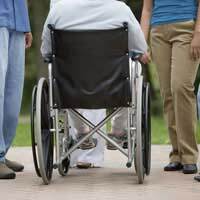 Local councils are legally required to give assistance in the form of Disabled Facilities Grants. These grants are available to both eligible private and social housing tenants in England up to a total of £25,000. You might be expected to pay some of the costs if you are financially capable, although this usually isn't too much. The grants can be used to modify your home in any way that will make it easier for the disabled person to get around. This can include, but is not limited to, modified bathroom and kitchen facilities, as well as heating control equipment. In addition to these grants, some councils can also provide low costs loans to private home owners to help modify their property. Other types of assistance are also available. If it is easier and more beneficial for the disabled person to move properties, then the council can help you find suitable accommodation. If you want more information regarding these services, contact your local council’s Environmental Health or Housing Department. Arranging to get work done yourself can be hard, but there is help at hand in the form of Home Improvement Agencies. These agencies are non-profit organisations that are run by housing associations and councils. They can give you free advice and offer support about how to adapt your property, as well as helping you to arrange modifications and pull together finances. This can ease some of the pressure and make the property adaptation process less stressful. For more advice on Home Improvement Agencies, contact the national coordinating body called Foundations. They will be able to advise you on the nearest agency in your area. Although you can get agency help, it is important to be aware of the procedures yourself. Remember that any large alteration to a building is likely to require planning permission, so you should check building regulations and consult your council if necessary. If the work is fine to go ahead and you have hired a builder yourself, you need to make sure they are up to the task. Only pick builders who have the necessary expertise and recommendations from other similar clients. Cutting corners now with poor builders will only cost you more time and money in the future. One of the major considerations when adapting your home is the sort of equipment you are going to need to make disabled life easier. For those who are physically disabled, you will likely need to get special equipment and install permanent fixtures to help you out. Items such as stair lifts or leg-lifters for baths and beds are useful items for those in wheelchairs. Look at the equipment that is on offer for your particular disability and buy those in your budget range that will really make a difference to your life. As well as permanent fixtures and equipment, there are many smaller devices that can help make everyday tasks simpler. Although many of these items will not be covered by grants, if they are important to you then you should consider getting them. Specific items you can buy include scales for the blind, vibrating alarm clocks for the deaf and bottle or kettle tippers for those with limited strength and arm movement. Disabled life might not be easy, but if you adapt your home in the right way you can live comfortably and save yourself a lot of time and effort. Even minor essential alterations can have a big impact on your quality of life and ability to carry out certain tasks. If you want to live your life as normally as possible, make sure you modify your property with some disabled home essentials.